Happy New Year! I know we’re half way into the month already, but I hope you’re all happy, healthy and sticking with your New Year resolutions so far. If you’ve been a member of the club for very long, you know that a year or so ago, I stopped just picking a couple great wines each month. Instead, I pick two great wines every month — that also fit some sort of theme or topic. For the first shipment of 2019, I decided, frankly, get a little weird. Let’s get outside of our cabernet franc-and-riesling comfort zones. Oh, and let’s not have a New York wine included — another strange rarity. So with “let’s get weird” in mind — this month’s first wine is Early Mountain Vineyard 2017 Petit Manseng. 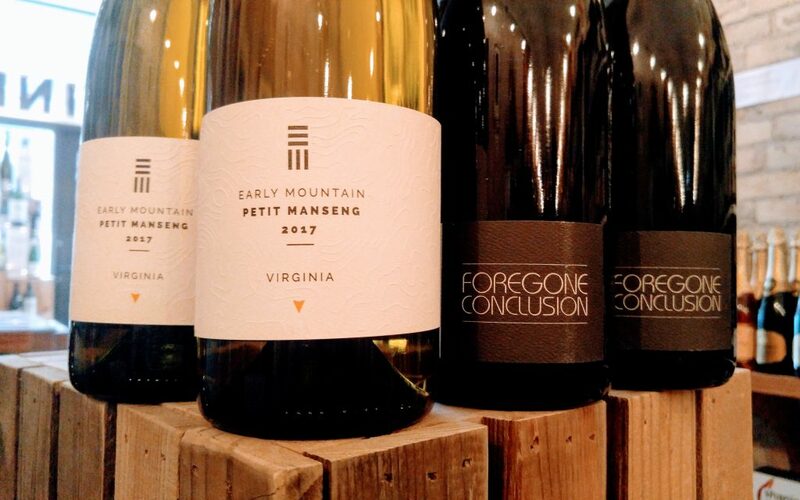 I’ve sent Early Mountain wines before — we did a two-pack last year — but for many of you, petit manseng is probably a new grape. It’s most commonly found in southern France where it’s used primarily for dessert wine, but it’s quickly finding a home in Virginia. The berries are small, the clusters are loose and the grapes retain plenty of natural acidity — making it an intriguing grape in a humid, often-hot region like Virginia. You’ll find it made in a wide array of styles there too, but Early Mountain winemaker Ben Jordan really plays with the texture of this wine by fermenting it in a combination of concrete, large Acacia, and oak puncheon and foudre. It is at once weighty and focused with acidity. The flavors lean tropical but there is also a floral, tea-like complexity here. This is a great white wine for this time of year and the foods I tend to eat in colder months. Southold Farm + Cellar is another winery that I’ve picked wines from before — but this is the first wine of theirs I’ve included in the club since their move from the North Fork of Long Island to Texas. It’s our first Texas wine in the club ever. Alicante bouschet is known as a workhorse variety. It’s grown all over southern Europe but rarely finds its way into bottle on its own — instead relegated as a blender for wines that need more color or oomph. But when winemaker Regan Meador found a small planting of it on rocky soil in the Texas High Plains AVA, he knew he wanted to let it sing a solo. It’s quite fruit forward and fresh on the nose with cassis, just-crushed blackberries and hints of plum. Lighter bodied and super fresh — there is a fresh grape quality that you don’t find in many wines — with brambleberry and currants dominating with a savory/umami edge and a minerally raw meatiness on the finish. Not super complex, but decidedly delicious. As always, I hope you enjoy the wines. Let me know what you think!